As the industry leader in backyard game courts, Court Development, Inc. has been the sole distributor of Sport Court® brand products in the state of Washington since 1976. With over 6,000 installations in Washington, Northern Idaho, and Alaska, we have the experience and track record to build you the right court to give your family years of fun. Through the years we have expanded our business to include home and commercial gyms as well as putting greens. We are the experts in backyard recreation and athletic flooring. Since 1976 our goal at Court Development, Inc. is to provide a safe place for your family to grow, play, and bond through the years. 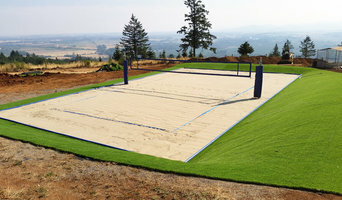 If you are looking to build your dream sport court give us a call today at (425) 970-8946 or click the "contact me" button to send us a message. We look forward to working with you! The Springfree Trampoline was designed by New Zealand engineer Dr. Keith Alexander, at the University of Canterbury. After more than 15 years of injury prevention research, the design was commercialized in 2003 and is now sold in 29 countries. Pacific Outdoor Products, Inc. has been designing and manufacturing locally since 1981. 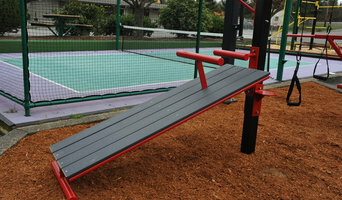 Local builders count on us for their playgrounds, outdoor fitness and site furnishing needs. They save money on freight, storage and delivery not to mention they are buying everything wholesale, direct from the manufacturer. Concrete flat work. Patios, driveways, walkways, steps, walls, sports courts and fire pits. All types of finishes, broom, trowel, exposed, tine, sponge, sand, color stamped and stained. Also offering concrete restoration services. Summerwood Products is a designer and manufacturer of custom Western Red Cedar Garden Sheds, Cabins, Garages, Studios, Pool Cabanas, Gazebos, Trellis', Pergolas, Bunkies and more. We offer stylish designs, customized for you and shipped anywhere in the world! We sell our buildings in custom kits and offer installation services for customers in the Greater Toronto Area. We've been in business for over 20 years, so we can also help source a reliable contractor in many world-wide locations. Ask us! Wonderstruck is a creative wedding planning, design, and coordination company in Seattle, Washington. We like to party – but we LOVE to plan and design. We help our clients make every aspect of their special event stunning and on schedule. All of our services are customizable to fit individual visions and lifestyles. We believe in passion, imagination, and designing with a touch of the unexpected. We strive to leave our clients and their guests Wonderstruck at their event. Shop our online store for hundreds of swing set parts and accessories for the backyard or commercial playground! 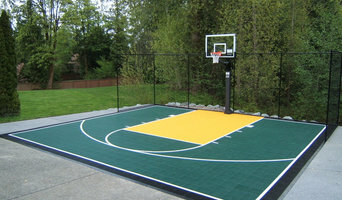 Whether you want to shoot hoops with friends or plan a safe kids play area for your little ones, there’s a Seattle, WA professional on Houzz that can help you turn your backyard dream into a reality. Sports court and outdoor play specialists in Seattle, WA design, install, repair, resurface and replace sports surfaces, including tennis courts, basketball courts and playgrounds. They have a thorough knowledge of sport rules, regulations and standards, such as court dimensions and net heights, and are required to stay on top of the latest sporting technologies and flooring systems. They can assist with planning and council approval before construction begins, as well as other unforeseen requirements, such as drainage and retaining walls. Aside from surfacing, they can also provide lighting, fencing and equipment to complete a recreational area. Find a sports court and outdoor play professional on Houzz. Scroll through this page to find professionals that specialise in playground and sporting surfaces in Seattle, WA, as well as play equipment and accessories. You can browse their latest projects, read reviews to see how other homeowners rate their work, and message them directly.